Remarks: This Print appears in the back of G.T.Emmons "Kitikshan Notes and Pictures, Skeena River. British Columbia,. 1909-1910" Caption on back is "Looking north from the middle of the village." 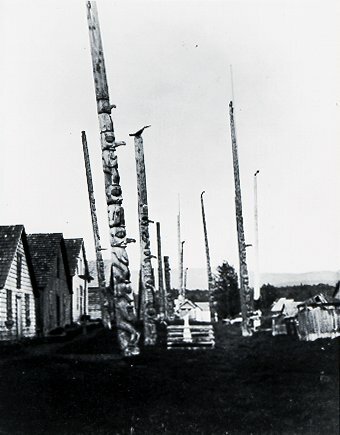 A similar view to this appears in Emmons "Kitishan Notes and Writings" p.49 caption reads:"The marble shaft with a bird on top surrounded by a rail fence is a grave and the smaller houses and enclosures shown to the right hand are grave houses containing ashes of the deseased."